(Close): There were more records broken on Wall Street, with the Dow Jones and S&P 500 indexes edging to new highs. Machinery and equipment makers climbed after strong results from Deere, but technology companies fell after HP gave a weak profit forecast. 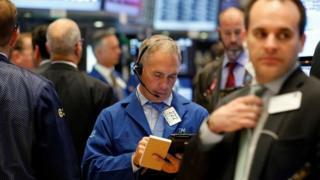 Stocks opened mostly lower, but soon began moving upwards on hopes that the US economy is continuing to strengthen. The Dow ended 0.3% up at 19,083 points, and the S&P 500 rose 0.08% to 2,204.7. The Nasdaq lost 0.11% to 5,380.6. Machinery maker Caterpillar rose 2.7% and hit the highest in about two years, while Deere jumped 11% to a record high close after the farm equipment producer reported a much smaller-than-expected decline in profit. Pharmaceutical stocks were hit after drugs giant Eli Lilly said it would stop developing its Alzheimer drug following a trial failure. Eli Lilly fell 10%, and rival Alzheimer drug developer Biogen closed down 3.8%. Healthcare stocks, like other sectors, had been hitting record highs in the wake of the US presidential election. Wall Street had little reaction to minutes from the latest Federal Reserve meeting, which showed that policymakers appeared confident that the economy was strengthening enough to warrant interest rate increases soon. "It's fully factored in," said John Traynor, executive vice president and chief information officer of People's United Wealth Management, in Connecticut.